It took a day for everyone to arrive and get settled (and start adjusting to the altitude) and then it was time for another hike (for me at least). 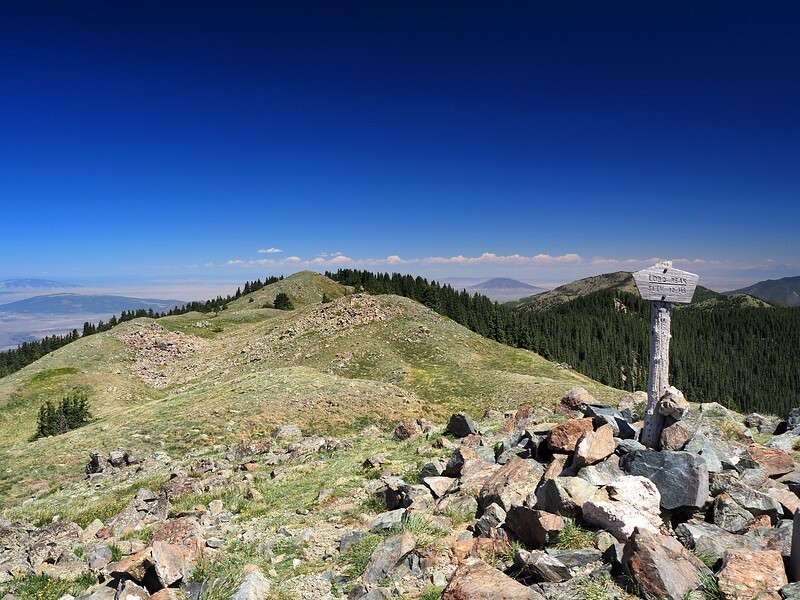 Up the road from where we were staying is the Taos Ski Valley and the trailhead to the highest peak in New Mexico, Wheeler Peak. We had climbed that one in 1993 from near Williams Lake, before the current short trail to the summit from there had been built (that was in 2011). 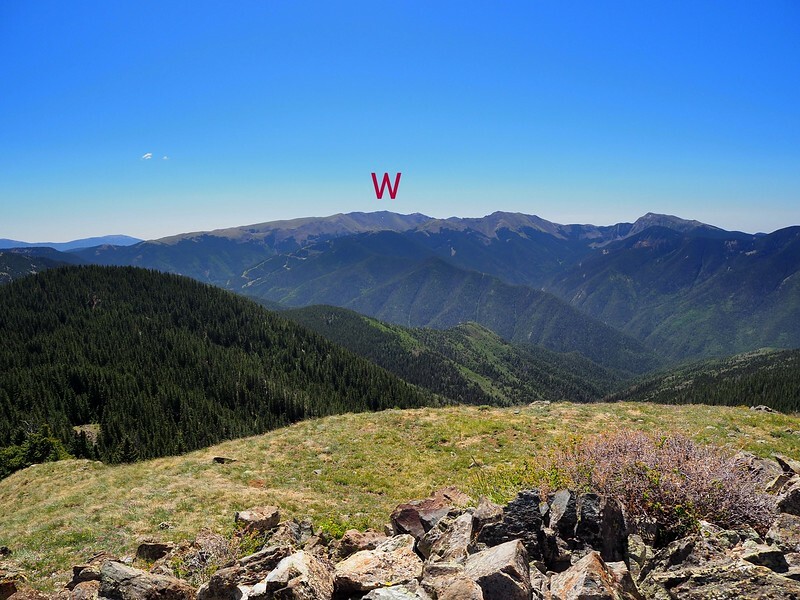 But there are other trails to other peaks in this area, many with views equal to those from Wheeler. 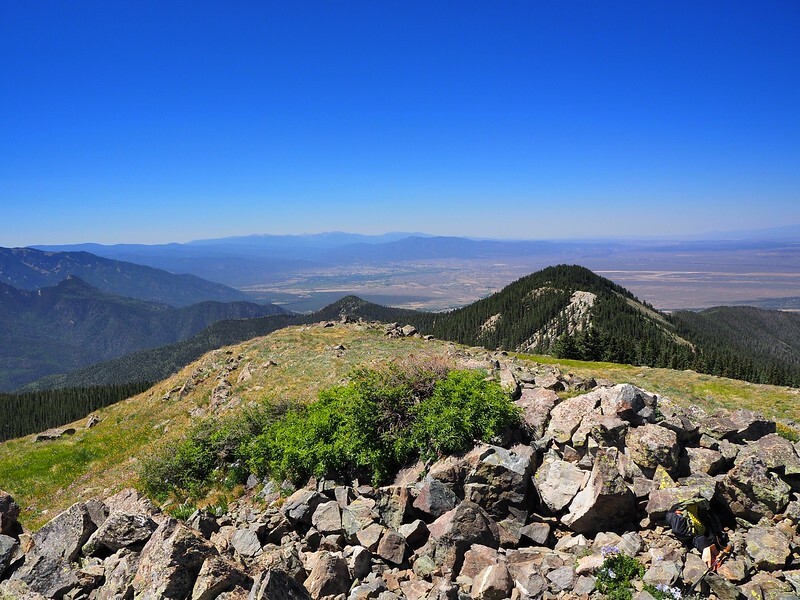 Lobo Peak (at 12,115 feet) is one of those, which you reach via the Manzanita Canyon Trail (USFS #58) from Highway 150. 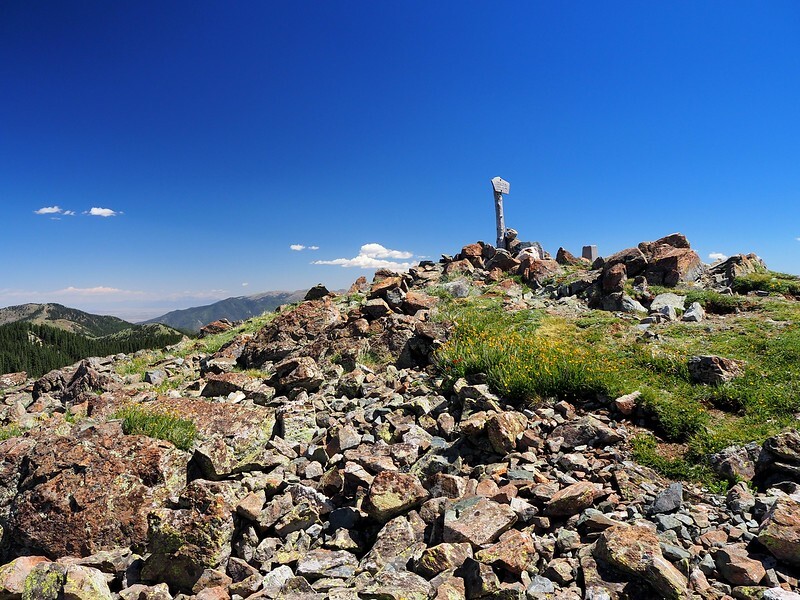 Despite my attempts to portray hiking as performance art, I was unable to convince anyone else to join me in a hike of a 12,000-foot peak (sigh). 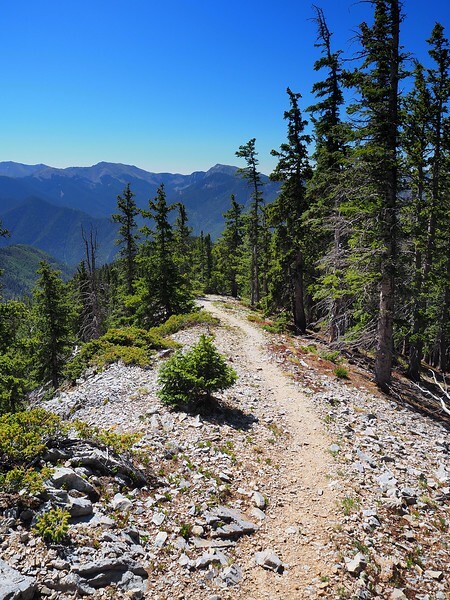 So while the assembled masses sought out “real” art in Taos, I headed out, in the cool of the very early morning, for a solo hike to Lobo Peak. 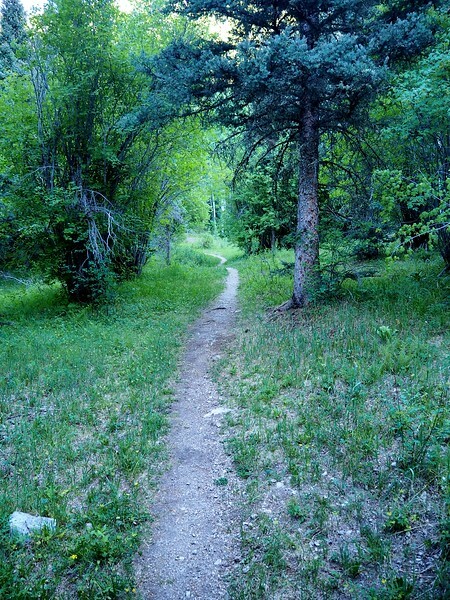 that eventually fades into singletrack. The first 2.5 miles of this hike were a steady climb along the creek, which was still flowing well despite the drought that’s plagued this area for the past few years. 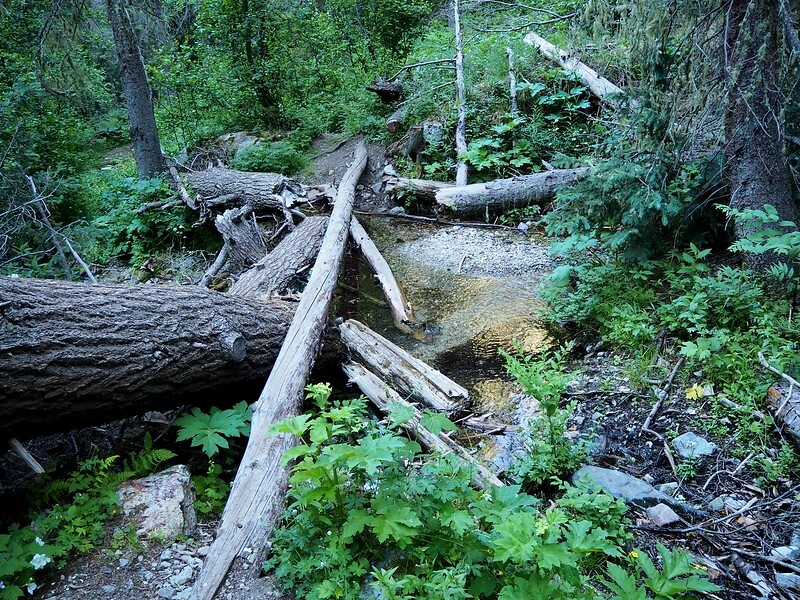 The trail managed to cross the creek some eleven times before climbing out of the canyon. At this time of year, none of these crossings were a problem but I brought a little frisson to one by crossing on a log well above the creek. 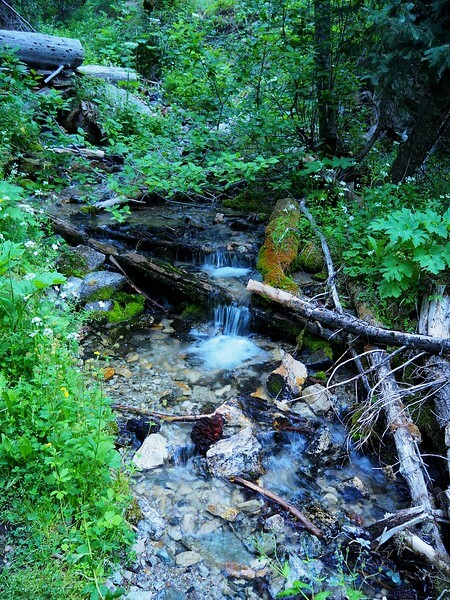 After the final creek crossing, the trail climbs away from the creek, quite steeply in a few places, but still in the cool of the forest. with a view of the summit – which looked farther away than I’d hoped. 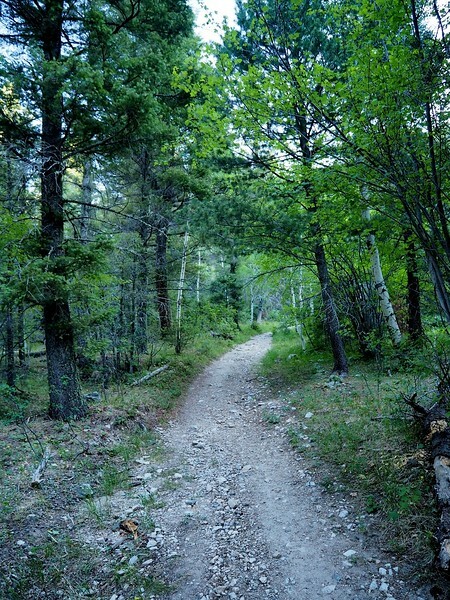 At four miles from the trailhead, I came to the end of the #58 at its intersection with the Yerba Canyon Trail (USFS #61). The final 500 feet from the rocky ridge to the summit seemed easier than I’d expected, probably because there were now views to distract me. 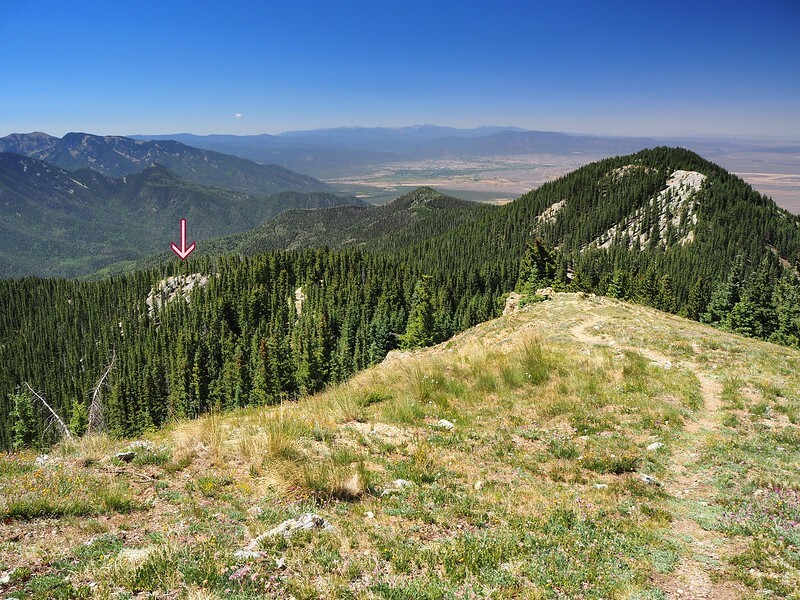 I soon reached the end of the #61 at its junction with the Lobo Peak Trail (USFS #57) and then followed a faint use trail from there to the actual summit of the peak, which is marked with a small wooden sign and benchmark. There was a steady, cooling breeze blowing over the summit, and the views from there were as expansive as promised (and expected). 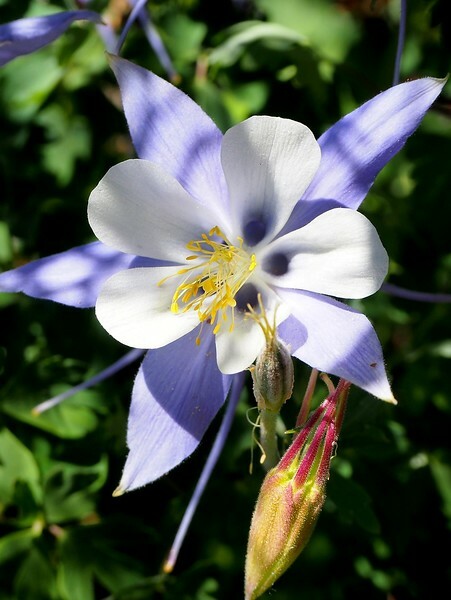 There were also patches of Rocky Mountain (or Colorado blue) columbines growing around the summit – flowers I haven’t seen since we lived in Colorado. That such delicate flowers thrive on this windswept summit at 12,000 feet is pretty amazing. 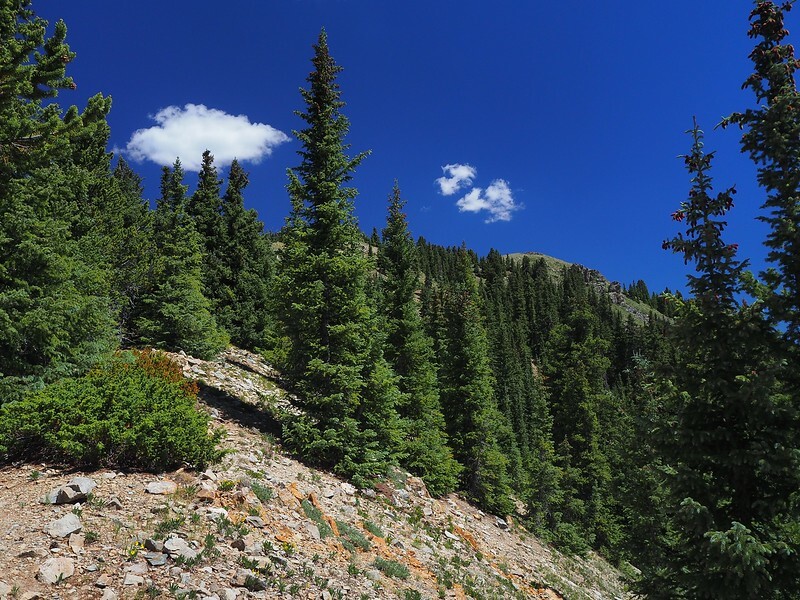 Then again, this hike is in the Columbine-Hondo Wilderness. 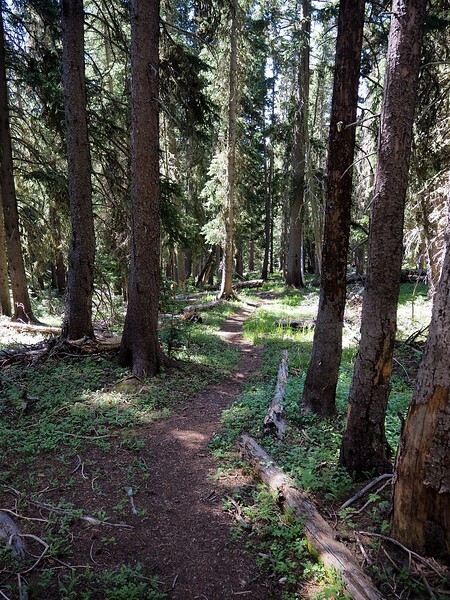 After a snack and taking some photos of others who reached the summit soon after me (this is a popular hike), I retraced by steps down the trail. It was obviously easier going down but the heat grew and grew as I descended. Back at the trailhead, it was in the high 80ºF range and I was glad for that early, cool start and the breeze at the summit. 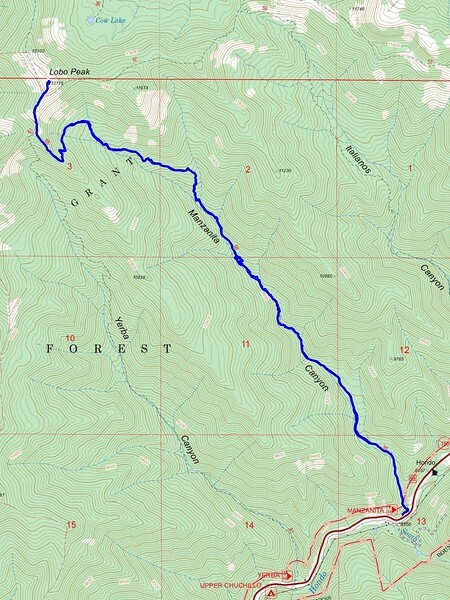 It may not be art, but it was a very nice hike (8.7 miles round-trip; 3,800 feet of elevation gain)!